Cascade Sotheby’s International Realty has been chosen to list an historic Dutch Colonial Revival in the stately Eastmoreland neighborhood of Portland. 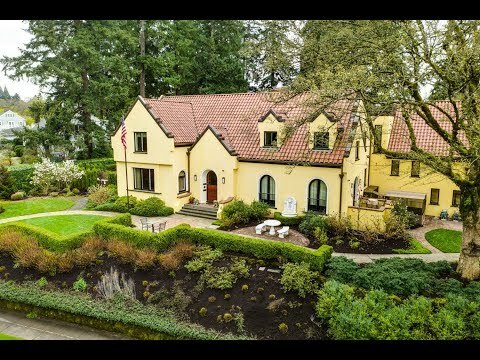 The 7,359 square foot luxury home was originally designed by Portland architect Bruce McKay in 1927 and has been showcased on architectural heritage home tours. After the home was purchased by Estelle M. Kelley in 2012, she embarked on an extensive multi-million-dollar renovation to both maintain the home’s historic significance while updating it for 21st century living. Kelley dedicated impressive amounts of time, money and resources to both maintain the essence and integrity of the gorgeous structure while ushering it into the 21st Century with new room designs, lifted roof lines, some expansion and innovative technology. The goals underlying the high-end renovation were to improve the home’s internal flow, improve energy efficiency, address safety issues, increase its light and allow the home to serve as a comfortable, timeless and highly-functional luxury residence for another 100+ years, all while maintaining the home’s unique character and historical charm. The exquisite home was listed this week by Cascade Sotheby’s for $3.35 million. It enjoys a .575-acre space in the city that feels like a beautifully-groomed flowering park with gardens and sitting areas all of which can be viewed from large windows that bring the outside in. Kelley says that from the beginning—and even more so now with its remarkable renovation—this sleek European-style house supports an individual’s desire to marry old or traditional styles of decor with new and transitional pieces. The home is not stuck in a decade or a century—there has always been an inviting clean and simple line to the home conducive to living beautifully, to raising a family and sharing your family home with friends. Replacement of every system in house: backup generator, water/sewer, natural gas, radiant heat, new AC units, modernized security, audiovisual, communications and media systems. I found this listing at 2928 SE Woodstock Blvd in Portland and would like more information. Thank you.